I wanted to do nine miles today so ran in fog over the downs to the path known to habitués of the Jog Shop 20 as the yellow brick road. Ran this evening along Seaford (t d) front using the feature on the Garmin Forerunner 301 that allows one to program training sessions at different speeds with recovery in between. Apart from some linguistic difficulty, the Forerunner and I understanding different things by the word repeat, and small hiatuses at the beginnings of legs when it told me both to speed up and slow down more or less simultaneously, it was successful. 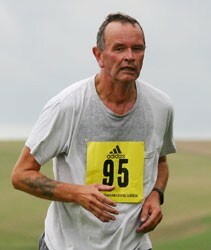 Aim was to do 1 mile at slow pace, then six half-mile fast runs, with two minute recoveries. A foggy and cold Easter Monday and I went to Toft and back, by way of Barton and Comberton. I'm in Cambridge. Having limited time, I concentrated on speed and I think did fairly well, at least it was a personal best for the route. Some explanation may help: this was a run known in our family as a Trumpington and Granchester, or TAG. It was a run done by my father (who ran for his college) and his brothers in the nineteen-twenties; in those days it started from our house in Regent Street, (which later became the Cambridge telephone exchange). The family moved to the house of my childhood in Lensfield Road in the 1930s and that became the starting point. But the term "tag" became family argot for any challenging physical encounter, and its antonym, "untag" came to mean any feebleness in the face of discomfort, exertion, pain or danger. For example, midwinter swims in the Cam were tag, refusing to take part in such excursions would have been untag. One more thing to report: it goes past my old prep school, and I was astonished to see an expanse of daffodils on the fields where we used to be tortured with compulsory games. Why are our schools pampering boys with daffodils when they should be teaching them new and better ways to hurt and be beastly to one another? Three weeks till the London marathon. To Seaford front on a glorious morning and along to the base of Seaford Head, the kittiwake nesting site that I now know is called Splash Point. Fog and sun again, and knee-deep in lambs, I ran to Firle Beacon and back. Fashion notes: I wore the vest that the Blue Cross have sent me for the marathon for the first time. It's a little short, though an L, but I suppose marathoners are tough and can cope with the sight of a bit of Roper abdomen. Also I'm not sure the shade of blue is quite me. No matter. A grey foggy morning and I was crippled by a hangover but since I had two rest days I made myself do a long-ish run, over to Bishopstone and then down to the front along to Newhaven and out along the East pier, then back along the front to Seaford Head. The health week route again, but this time in the conventional direction. The photos are now up. But I'm afraid I don't think any of these do justice to my puissant technique or film-star good looks; the camera often lies.